Katie: This review is a little different too the other reviews we have posted, as although Chelsie and I have both done the Afternoon Tea we did it on separate occasions. I attended this afternoon tea for my mothers birthday in June (2011) and Chelsie in May (2011). We would both like to mention early on that this tea was exceptional, and certainly in my case the best tea I have been too. The Berkeley is located not far from arguably the best shops in London both Harrods and Harvey Nichols, with this in mind could you think of a better location to hold a fashion afternoon tea such as Prêt-à-Portea? 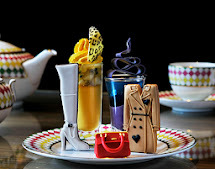 This tea combines both traditional tea with a range of finger snacks and cakes that are inspired by the seasons fashion trend, and like fashion the tea's selection changes every six months. The season that both Chelsie and I attended had this dreamy collection; A peach sponge cake purse with chocolate crocodile print (Victoria Beckham), a raspberry and lychee jumpsuit adorned with an over-sized chocolate flower belt (Marc Jacobs); and a vanilla bikini biscuit with navy icing and white bow (Miu Miu). If that doesn't sound fashionable enough, the Afternoon Tea is all served on Paul Smith chinaware! As Previously mentioned I attended the Prêt-à-Portea for my mother's birthday and before hand sent an email to the staff at the Berkeley. I was genuinely touched at the effort the staff made to make sure my mother and I were content, and just before leaving a special plate with a candle was created without any additional charge and presented to her. This made her day, and it made mine. Chelsie: At this afternoon tea unlike many of the others I have attended we were given 'top ups' in all areas which included sandwiches, snacks and cakes throughout the tea without any additional fee, this was all done with a smile by the staff and we were even allowed to take some home. Not only was the food amazing quality but it is really good value for money. The peach sponge cake purse with chocolate crocodile print (Victoria Beckham) was delicious ! This Afternoon Tea is Amazing! 5 Stars! We would defiantly recommend this Afternoon Tea, it is ideal for Birthday's with loved ones as we can both personally testify. 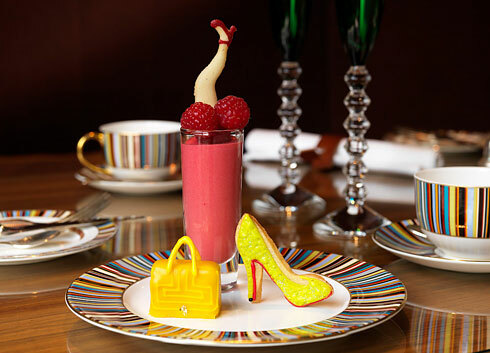 This Afternoon Tea would be in the quirky and modern category. Includes a glass of Laurent-Perrier Champagne. Includes a glass of Billecart-Salmon Rosé, Laurent Perrier Ultra Brut, Laurent Perrier Grand Siècle.